A modern classic. Timeless songs lovingly rendered by an exceptional artist. Not only does this contain a remarkable chain of finely etched songs sung by a singer of great soul and focus, it’s one of the best sounding albums to come along in a long time. Whereas many records we hear reduce the sound of an acoustic guitar to a slim ghost of itself, this goes the other direction and gives us acoustic guitars as rich as orchestras, with all the dimensions, inflections and frequencies singing with shining clarity, warmth and depth. Guitars singing low and high, sparkling, shining. 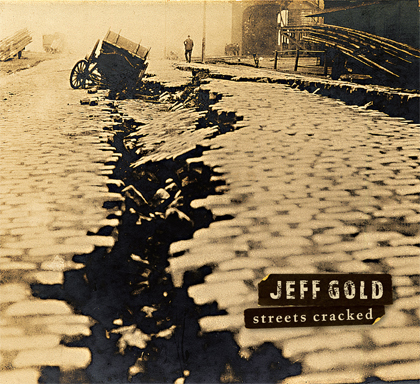 Jeff Gold’s long been beloved on the L.A. and New York folk scenes as not only a gifted singer-songwriter, but one of the best finger-style guitarists around, and this album celebrates his fluid flair for rich guitar expressions, on which each track is based. An acolyte of the late great New York songwriter Jack Hardy, Gold walks in the footsteps of his mentor to create modern folk songs – elegant work which reflects the triumphs, failures and mysteries of modern times with the organic grace of folk songs. There are no affectations here, odd stylistic divergences or fluffy filler. This is pure. It’s also a primer of sorts on how best to produce a singer-songwriter, as Gold the producer delicately frames each of these songs so as to bring out the story – and the tune – and not overwhelm or detract from the narrative. Most songs have two guitars, bass, a lead vocal. There’s hints of percussion here and there, and on the beautiful “Intuition,” Gold himself on “breathy alto sax.” (He’s one of the only singer-songwriters around who is also a fine horn player, both sax and clarinet.) There’s also lovely harmony singing throughout, provided by Lucy Hagan and Mark Mugrage, whose voices blend with Gold’s reedy baritone ideally. “Three Strangers” resounds like a lost folk classic, but is in fact original: a beautiful, mysterious and driving ballad empowered by their three voices in perfect harmony. It evokes passionate folk vocals of the past, especially Peter, Paul and Mary and The Weavers. (The potent sweetness of Lucy Hagan’s voice is quite reminiscent of The Weavers’ great Ronnie Gilbert). “You’re driving home in the wind,” he sings in the opening song, “At The End,” a song about the essential journey that is life. To start an album at the end is funny, but also reflective of the circles inherent in all we experience, in life, time, distance – and of course, songs. “Streets Cracked” remains the best song ever written about surviving an earthquake, and has long been one of his most popular concert songs. It’s about hope, about going home, about triumphing over even the most adverse adversities in “this western town under a western sky.” When the whole world starts cracking up, the dreams humans dream don’t disappear. They thrive, just as human faith and love endures: “I’m still alive,” he affirms. “Turn Around” is funky rock-folk of the best kind. It’s funny and serious as the same time, delving into human mysteries. “How can you ever expect to be happy when all you do is complain?” “Intuition” is wintry and beautifully haunting. “To England and Argentina” is the final track, a demo recorded on a boom box. It is breathtaking. Beautiful flourishes of guitar work, and a slinky and remarkable melody that traces the elusive lyric about not really understanding why we do what we do. “We just do.” It’s a contemplation on human nature, as is this entire album, and like the best songs resounds long after you stop listening. If you want pop confection, this isn’t the place to turn. But if you love deep songs that delve into places often unexplored, and with beautiful singing and poignant acoustics, this is a place you want to be. Here in these times when so much of our lives is disposable or recycled, he’s made an album for the ages. Put it on the shelf with your most beloved albums, the ones by Dylan, Seeger, Guthrie, and Lennon and Simon and the rest. That’s where it belongs. This is a keeper.